We all know which rolls I’m talking about. From the restaurant that we pretend we’re going to for other reasons, but secretly we just want to eat as many rolls as the water will bring? Yeah, those ones. You might think that these rolls might be complicated or fussy to make, but really they’re not at all. Simple ingredients, simple preparation, outstanding results. Have you ever wanted to have a “signature” item that you’re famous for amongst your friends and family at holiday gatherings? 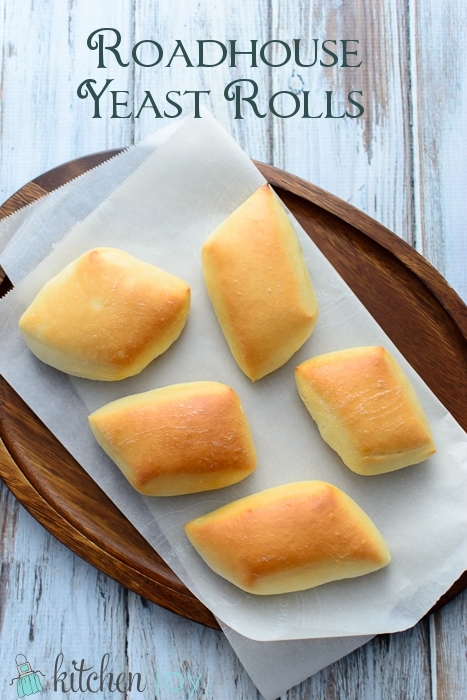 These rolls will do the trick. Everyone will love them. If you really want to go all out, whip up some of this Cinnamon Honey Butter too. It’s pretty much life-changing. 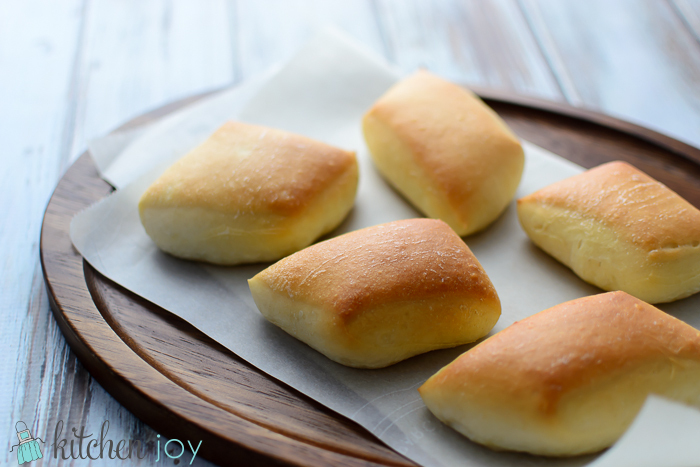 These Roadhouse Yeast Rolls are phenomenal on their own. Delicate, fluffy, buttery. 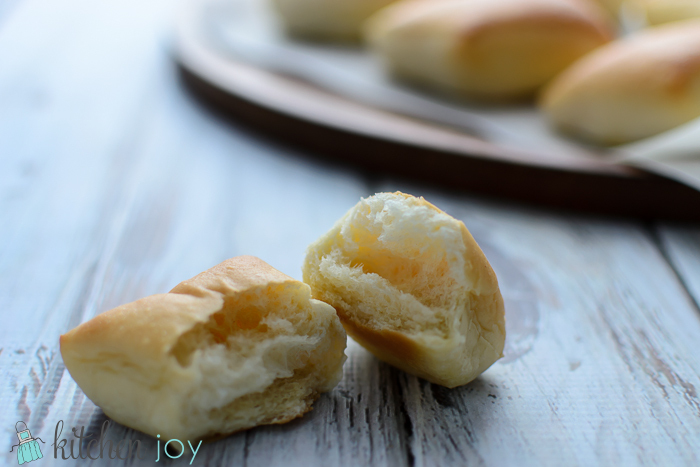 They are outstanding when used as a bun for sandwiches and sliders as well. All the buttery deliciousness of the restaurant in the privacy of your own home, where nobody will notice if you eat 2 or 10. I don’t know the nutrition facts of the restaurant version, but I’m almost certain that theirs contains way more butter than this version, so these must be a healthy alternative, right? Okay, so maybe not exactly healthy, but they’re worth it. Trust me. In the bowl of a stand mixer, combine yeast and warm water. Let stand 10 minutes until yeast begins to foam. Add warm milk, 3 tablespoons melted butter, and sugar to the yeast mixture and stir using the paddle attachment. Add 1-1/2 cups of flour to make a medium batter, similar consistency to pancake batter. Add egg and salt. Mix well. Switch to the dough hook and gradually add remaining flour with the mixer running on medium speed. Continue kneading on medium speed for 5 minutes until dough is smooth. Place dough in a large bowl sprayed with cooking spray and cover with a clean kitchen towel or plastic wrap. Let rise in a warm place until dough has doubled in size, about 1 hour. Remove dough to a floured surface and punch down. Knead by hand for a minute or two then cover with a kitchen towel. Let rest for 10 minutes. Roll dough out into a large rectangle about 1/2-inch thick. Using a pizza cutter, cut dough into rectangles (or whatever shape you would like). Place dough rectangles onto two baking sheets lined with Silpat liners or parchment paper. Cover with towels and let rise again until doubled in size, about 1 hour. Preheat oven to 350 degrees F and bake for 10-15 , or until golden brown on top. Remove from oven and brush with melted butter immediately.